This museum is located in a building as magnificent as the treasures it houses, la Casa de la Real Aduana. Established in 1953 by a critic from the island, Eduardo Westerdahl, the creator of contemporary art museums in Spain, along with the architect José Luis Fernández del Amo, founder of the Spanish Contemporary Art Museum (now called Reina Sofia Museum). It was designed together with MACEW in 1952. Westerdahl relied on the support of his wife, Maud Bonneaud, and the painter Óscar Domínguez and the Swiss architect, Alberto Sartoris, to complete the construction. There’s no better way to discover 20th century Canarian art especially from the surrealist movement and renowned artists from the 50s to the 80s including Juan Ismael, Óscar Domínguez, Karl Drerup, César Manrique, Manolo Millares, Will Faber, Pedro González y Carla Prina, to name just a few. As well as local artists, some other prestigious artists, such as Wolfgang Paalen, Angel Ferrant, Luc Peire or Eduardo Úrculo, have their work on display here. Opening hours: Monday to Saturday 10.00-16.00. Friday 10.00-16.00 and 17.30-19.30. 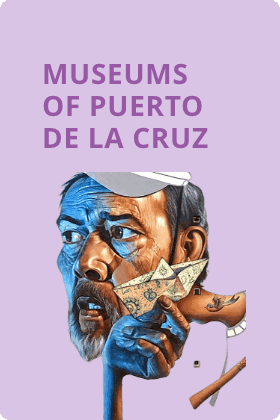 The museum opened its doors in 1953 as an initiative from the Canarian Hispanic Studies Institute. It houses a very interesting collection of aboriginal pottery, mummy tombs of the island’s native people and cartography from the 17th century. The museum has been housed inside a building that dates back to the 18th and 19th century since 1991, is made up of two floors and overlooks the El Lomo and San Felipe streets. The façade of the building boasts a huge balcony divided into five separate parts featuring glass shutters and decorated with huge jar shaped pillars. The building’s main entrance is through the rear courtyard which you can access on El Lomo Street. “La Cerámica Guanche”, a permanent exhibition, gives you an insight to what life, the glory days and the downfall, was like for the “Guanche” community. If you’re really passionate about this subject, its worth finding out beforehand if you can visit the cold storage room where you can lay your eyes on the museums most valuable and delicate items. The staff can offer you a guided tour which is sure to take your breath away. Timetable: Tuesday to Saturday 10.00-13.00 and 17.00-21.00. Sunday 10.00-13.00. Monday closed. 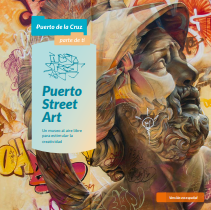 In 2014 this street art project was launched and it’s celebrated along with other important cultural events: Mueca Festival and Periplo Festival. Get to know the city through its art by visiting the various exhibitions at this open-air museum. The well-regarded Mural 00, a relic of the 60’s from la Sala Mural de Puerto Street Art can be found in Plaza del Charco. In Mequinez Street, you can find a map with all of the information needed to start the route. The murals were created by some big names in the art world such as Roa, Martin Ron, Pichi & Avo, Dulk, Belin, Liquen, Sebas Velasco or El niño de las pinturas. Each mural identifies the name of the work, the artist along with some basic information. In the second exhibition hall, you’ll find Intervenciones urbanas, which are miniature pieces found on urban furniture, on the streets or on walls. There are colourful walls known by the locals as nombretes in La Ranilla district which were created by a local artist, Juliana Serrano. Heading east, to the area known as La Hoya, Avenida Familia Bethencourt y Molina and Avenida de Colón, you’ll come across the amusing visual poetry of the French artist OakOak. You’ll find nine of his artistic pieces in this area of the city.